Cut 30 and 60 degree angles up to a finished height of 12in. 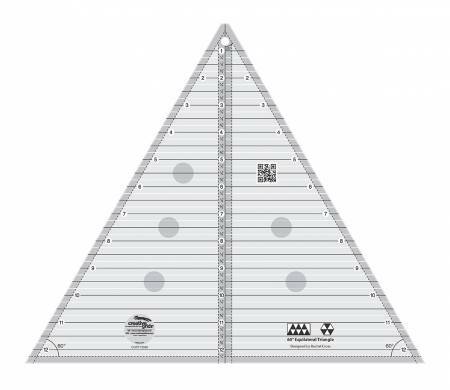 This 60 degree equilateral triangle features easy to read black and white markings. A 1/4in dashed line is printed on each side of the center vertical line so you can cut 30 degree triangles that include the seam allowance. The ruler slides easily over the fabric until pressure is applied. Then, our exclusive gripper holds the fabric in place while cutting, eliminating slipping and miss-cuts! The ruler comes with fully illustrated step by step instructions or scan the QR Code printed on the ruler to view a video demonstration of these features. Creative Grids Rulers have a MAP (Minimum Advertised Pricing) Policy. Please do not advertise them for less than the suggested retail.